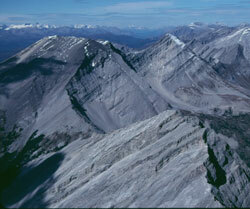 Mount Gass is made up of two peaks, the southern being the highest. 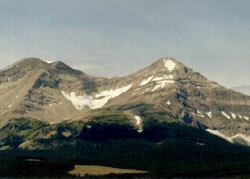 A mine was once located just to the north of the ridge that descends into the Oldman Valley from the northern summit. 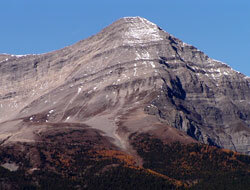 King Bearspaw was a Stoney Indian who became familiar with the mountains at the head of the Oldman River. During his explorations in the early part of the century he noticed some unusual rocks high on the eastern slopes of Mount Gass and decades later mentioned them to Bill Watt and some friends from Nanton who had some knowledge of prospecting. In 1948 they staked a claim on the mountainside, realizing that the "interesting rocks" contained galena, a lead ore, as well as silver, zinc, and even traces of gold. Western Canadian Colleries were also in the Upper Oldman Valley exploring for coal. They took notice of Bill's samples, followed the tracks to the site, and eventually gained control of the lease and established a mine. Hand picked pieces of rock were extracted from the mine which tunneled some fifteen metres into the mountain side. The ore was loaded into boxes, and winched up a chute over the east ridge of the mountain to a very rough road. The operation was very small scale and continued for a few years in the 1950's until it was determined to be uneconomic. The well known Swiss Guide, Bruno Engler lived in the Crowsnest Pass for a few years in the late 1940's and early 1950's. In 1954 visited the mine site on Mount Gass while looking for the legendary Lost Lemon Mine with his friend, Fritz Frei. While exploring above the mine, Bruno asked Fritz to stop for a moment so that he could take his photograph. Bruno later wrote, "I dug out my Rolei camera and started to focus the ground glass. Fritz stood silhouetted in front of a snow-covered mountain in the frame. In my excitement to get the picure, I carelessly stepped backwards out into space. Terrified, I turned in the air, letting the camera fall out of my hands. I fell about 30 feet and hit the rock face, jamming my nailed climbing boots into a crack. I flipped forward onto a steep broad shale band and now I was sliding down towards a 200 foot cliff. I dug my fingers into the moving shale, trying to slow my descent. I finally came to a stop, just a couple of feet from the brink." Bruno had broken his leg and after an epic struggle his friend Fritz succeeded in getting Bruno to hospital for treatment.